Teal’s “tell all” in gory detail about her alleged Satanic Ritual Abuse on TV with Chris Oswald. Teal presents herself as an inspiration to her followers as having overcome alleged childhood satanic ritual abuse, and with that, she believes she is a “spiritual luminary“, “spiritual authority” (1) and “revolutionary” on the level of Tesla, and other historical leaders (2), giving her an edge over conventional medicine and therapy. Since she believes she is revolutionary, this is the reason why she allegedly has “haters” and “hate groups”. To try and validate what she teaches, she claims to speak from “source perspective”, or just “source” – which means speaking for God (3). Teal claims that she has extrasensory psychic abilities (4), and that she is an “Arcturian extraterrestrial”, incarnated to be the spiritual leader that she is (5). She relies on these experiences, and alleged abilities to elevate herself as a unique being here to “Willingly die to leave the world or willingly alter the world” (6). Teal conducting psychotherapy on stage at one of her “Synchronization Workshops”. Teal hosts what she calls, “Synchronization Workshops” for on-stage therapy sessions in front of live audiences, and offers three-day courses on how to become a “Completion Process Practitioner” (psychotherapist). She sells books, art, tarot cards, and merchandise. She claims her practice shared in her latest book, The Completion Process, can heal “Any kind of trauma you might have experienced will find resolution through this process” (7). Teal claims that her “Frequency Paintings” realigns people’s vibrations. Since this website’s focus is on death and suicide, she claims that one of her paintings is a “very good vibration for anyone who wants to release resistance to death.” (8). Teal oftentimes diagnoses the audience at her workshops with a “dominant negative vibration”, and also generalizes entire cities and countries as well. For example, she diagnosed the Czech Republic with a “iron curse”, and New York with “cut throat” negative vibrations. She shares these assessments at her workshops around the world, and in her blogs (9). Teaches her followers that they can be a “vibrational match” to persons, places and things. For example, Teal believes that she is “a match to a very gruesome public murder in every single one” of her potential life paths. For vulnerable followers, this could trigger paranoia (11). From observing her current media, her behavior displays that she is unstable. This can be gleaned from her Instagram “Daily Updates” (12), blogs, interviews and even her workshops. She justifies her conduct by labeling it as an “Authenticity Movement” (13), and her followers justify her by saying “she’s only human” — even though she is a self-declared “spiritual leader of the new age”. She bares all in her blogs, interviews, social media, and at her workshops at the expense of others, but exclaims that she is a victim of people in the past and in the present. Her followers pity her, and loyally defend her. Teal seemingly does not have any sense of how important training and preparation is for emotional, spiritual and psychological work. Without even a basic grounding in basic psychology, counseling, mental health challenges, trauma and its complexities, repressed memories, and related issues, she and her practitioners, can potentially exacerbate psychological issues for their “clients”. Teal rejects that working with repressed memories can be dangerous. She does not believe that false memories can be a serious issue and trigger mental instability [see example case]. It is also known that false memories have lead to innocent people being accused of crimes. For severe challenges such as those with post traumatic stress disorder, or any mental disorders for that matter, the consequences of irresponsibly providing her Completion Process therapy, can be dangerous. Teal further displays her lack of education, believing that mental illness is the result of not thinking positive thoughts. She states, “Mental illness is always the result of you thinking thoughts which vibrate at a frequency that is very low. So you’re focusing on things that do not feel emotionally good to you, so that is the cause of every single mental illness. It has nothing to do with the brain itself” (14). However, in another blog the cause of mental illness is something different. Teal states, “At the heart of most every mental health diagnosis is one symptom… feeling too much of an emotion” (16). Since Teal has no license to provide counseling and psychological services, she has no accountability. Unlike behavioral and medical professionals who can have their license suspended, or revoked for malpractice, there are no regulations (ethical principles and code of conduct) for spiritual teachers who practice mental health therapy. If followers seek legal assistance for malpractice, a lack of license sets up an inconvenient stumbling block to pursue legal recourse. It slows down the process as an investigation is required. However, without a former client’s prompting, the State of Utah’s Department of Professional Licensing investigated Teal on their own, and found that she breached state laws, and was issued a citation, Cease & Desist Order and fine for practicing mental health therapy without a license [details]. It is concerning that many of Teal’s followers consider her as a solid and trustworthy source for guidance and information for health and well being as many of them believe she receives information from “Source” (God or the “Akashic Records”). A follower of Teal posed a question in her group, “…why do you highlight things in them [books]? Silly question. Are books a source of information to you? I believed you get everything from ‘above'” (15). What is even more troublesome is they lack qualified support in Teal’s Facebook group, Teal Tribe. As witnessed in her group, many of her followers suffer from mental illness – namely mood disorders. Her followers believe in her to such a degree, they will devotedly defend her. See “What followers say…“ to get an idea of the type of defensive statements they make when Teal is questioned. It is common these followers reject conventional medicine (educated and licensed trained professionals), which is, of course, an important component required to become safely stabilized. Safe is the keyword here, given Teal’s questionable practices. Teal’s followers are convinced that conventional therapy does not work. They tend to generalize behavioral and medical professionals as not “evolved” enough on a spiritual level, see them as part of “the system”, and believe their solution for those who suffer from mental health issues is to throw them into a psyche ward, or that they solely are working for big money from pharmaceutical companies. It is unfortunate that some followers parrot these misguided beliefs directly from Teal. That it is not to say that there aren’t questionable elements about conventional medicine, but this black and white thinking s limited and leads to a myopic understanding of the world – only one way, is the right way. To learn to the degree of Teal’s propaganda about conventional mental health treatment, read her blog, “The Mental Health System, The Land of No Return” (PDF), and “Rebuttal to ‘Teal Answers Allegations” for Teal’s suicide segment. Note, Teal’s fourth and current husband Ale Gicqueau (at age 32), sold his two software companies that support pharmaceutical companies in 2017 for millions of dollars (one of Teal’s many hypocrisies). One has to wonder what is the real reason she married Ale. Teal believes, “What suicide is, is a reset button”. While this ideology is one’s choice to believe, it is particularly concerning that many of her followers suffer from mood disorders, such as anxiety, PTSD, and depression. In Teal’s Facebook group, suicidal ideation is common. It is extremely irresponsible to minimize suicide in this way. It makes one question if Teal’s “teachings” – her “shadow work” is really healing. 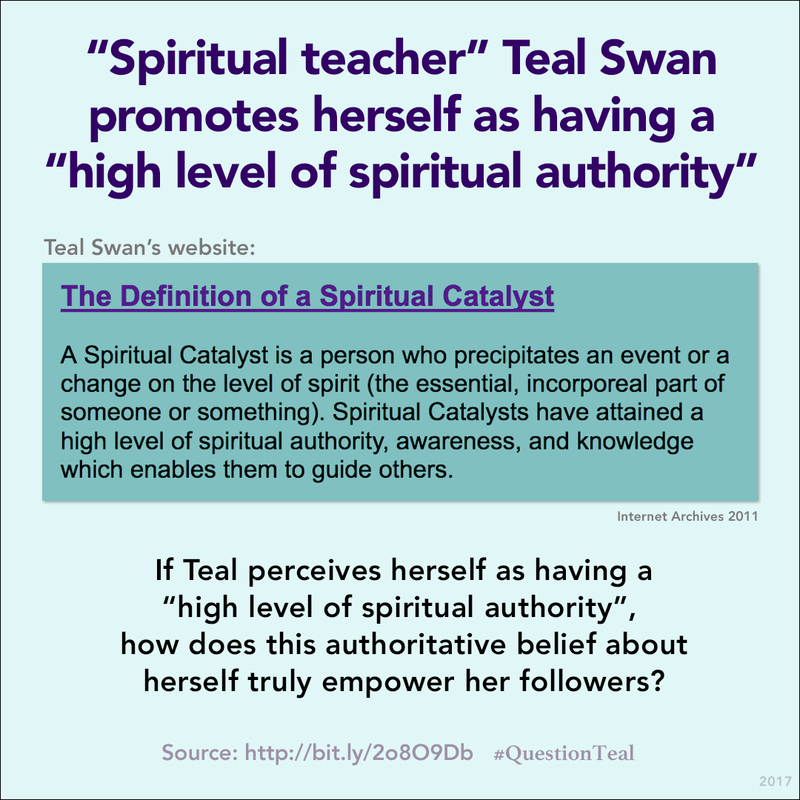 Teal places herself in a position of authority as a spiritual teacher, and with that, she has influence, and carries a level of responsibility. Her devotees believe that people just don’t understand her unique perspective on death and suicide, and are not “spiritually awakened”.